Sports Rendezvous: Llorente hat-trick sees Tottenham through after VAR-sical scenes at Wembley. Llorente hat-trick sees Tottenham through after VAR-sical scenes at Wembley. 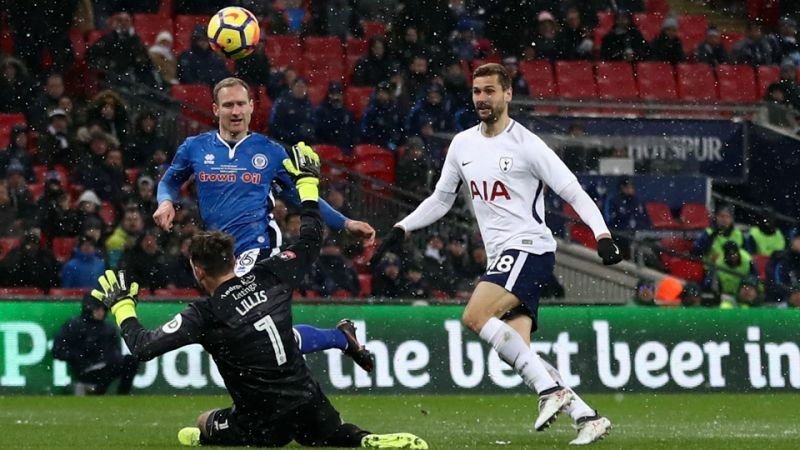 Fernando Llorente's hat-trick fired Tottenham into the FA Cup quarter-finals after sealing a 6-1 victory in a fifth-round replay against Rochdale marked by controversial video assistant referee (VAR) deliberations. The Spaniard's second-half strikes restored the Premier League side's control of the contest after an opening period that threatened to descend into farce due to a number of dubious refereeing decisions involving VAR. There were lengthy pauses in play while referee Paul Tierney consulted VAR, before disallowing a goal for Erik Lamela after six minutes. A penalty for Spurs was also rescinded. Son Heung-min put Spurs ahead but the League One visitors levelled through Stephen Humphrys and boos rang out around Wembley at half-time as the Spurs fans voiced their frustration amid the confusion.